Only 1d 16h 32m 52s left! (Jan. 2008) Hello everyone and thanks for visiting my page. My name is Tom, and I've been interested in art and sketch drawing as a hobby for as long as I can remember, although never very seriously. In mid 2007 I started using Poser 6 and Photoshop Elements, and have been 'hooked' on '3D' art ever since. I'm still learning to use various 3D modeling programs to try and develop some digital art skills. I enjoy getting feedback from other artists on what to work on and how to improve. 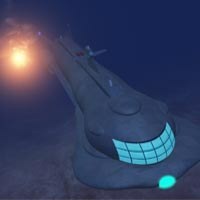 (Feb. 2009) The submarine I've attempted to animate is from an old TV show in the 1960s called 'Voyage to the Bottom of the Sea'. Although the show was kind of cheesy, I remember watching it after school along with old episodes of Star Trek.